Sheaqueous Cream is a natural aqueous butter for dry skin. It helps to moisturise, soothe, protect and maintain your skin in Good condition. Made from naturally emollient oils found in nature, with pure unrefined organic Shea butter at the heart of this rich formulation, Sheaqueous cream is ideal for the whole family, from babies to adults. 50% of the group had skin conditions including extremely dry breaking skin, eczema, dermatitis, psoriasis and acne. 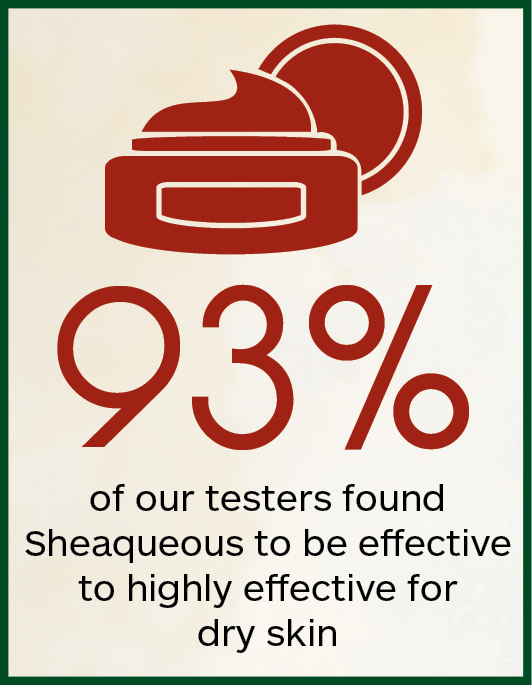 65% of those found that Sheaqueous relieved their condition. This new formula was created due to the success of our existing aqueous moisturiser and high demand among our customers for a multi-purpose cream for the whole family. So we’ve revised the formula and packed it with even more natural ingredients to nourish the skin.